A Man with a Plan | News and Features | Style Weekly - Richmond, VA local news, arts, and events. Before he got his doctorate in urban and regional planning, John Accordino started his career as a community organizer: “Me and Barack,” he says, laughing. 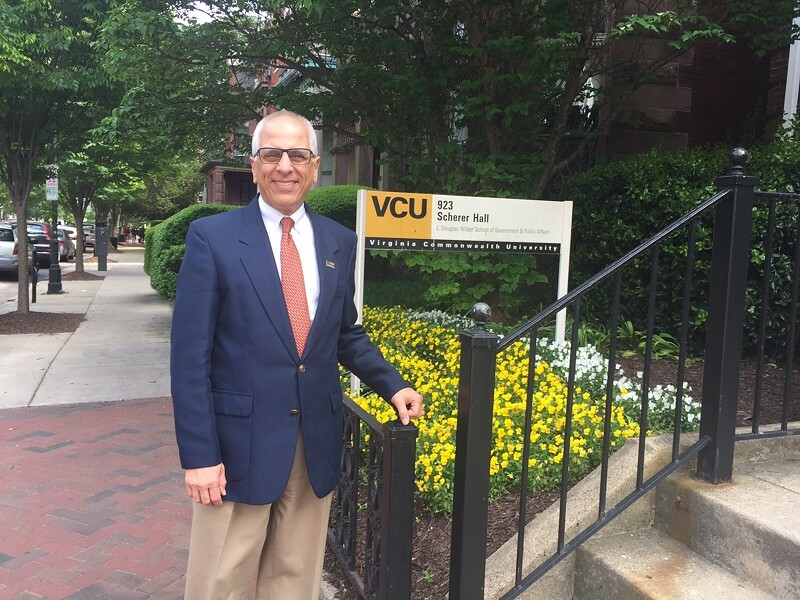 He brought an appreciation for that on-the-ground connection between people and their communities to Virginia Commonwealth University in 1986, where he helped establish and ran the Center for Urban and Regional Analysis for three years. In March, Accordino became dean of the Wilder School for Government and Public Affairs, where he now oversees five academic programs and six research and consulting centers. Style sat down with him to talk about the practice and theory of planning, how the university and Richmond have grown together -- and what lies ahead. This city is lousy with your masters in urban and regional planning graduates and their thesis plans for Richmond neighborhoods. How do you make sure those don’t languish in libraries? This is really important. Regardless of who comes to us for a plan, we do not ever practice “gotcha planning." Meaning that we’re not going to do a plan and tell you, “Hey we need to do this.” We’ll be interacting with the community throughout the process so that you know exactly what we’re doing. And it makes no sense for us to go out and do a plan that's not going to be implemented or that can't happen, because that doesn’t serve the neighborhood. We don't want to create false hopes. So we strive to think about implementation from the very beginning. It’s not just about doing a plan that looks cool -- it’s about what’s the problem that this community is articulating. For example, there’s no place for kids to play, or it’s not safe to walk home from school, or people don’t have jobs -- whatever it is. We are a little bit like barber-training school -- you learn how to make that haircut while you’re making the haircut. Why are people willing to accept science about, say, pollution, but they’re not willing to accept planning data and traffic engineering analysis that shows, for example, that narrowing streets can calm traffic? Fortunately, they don’t. People live their environment. They see it every day; they know what their experience is. So, they feel they’re experts. Pollution is something kind of scary and scientific. I don't know what those chemicals are or what they’re doing to me, so I need to be worried. But planning really is very close to people, very close to where they live. And that’s not a bad thing, because it helps them engage and take it seriously and that’s really, really important. At the end of the day, if planning doesn't make people feel good about their environment, it's useless. But the danger in that is -- people live a pretty narrow life, when you think about it. We go over the same routes every day. We end up narrowing ourselves. And we come to think that we are the experts because of what we experience. We could be shoving off a lot of opportunity that would make us happier and more comfortable. And I think the narrow street issue is one of them. People grow up living in detached housing on quarter acre lots. That’s their reality -- it feels right, it feels good. But they maybe have not had an experience of being in a denser environment that they might potentially have enjoyed as well. As planners, we’re spending day and night on this stuff. We get frustrated. But it's obvious why they don't see [it]. What are some of the most interesting changes you’ve seen in city government and what are some of its biggest challenges going forward? Back in ‘86, near the nadir of the city -- population had fallen below the magical 200,000 number -- and I think a lot of people had lost hope and faith in the city. It’s important to note, throughout the entire time of Richmond's population or economic decline, the city continued to try to reinvigorate itself through in investment. I think some people get the notion that Richmond just went to sleep for 40 years. No, Richmond was trying and investing the whole time. But the city was not having tremendous success for one big reason. Demographics were against it. The baby boom grew up and most moved into suburbs. And it's really since 2000 with the millennial boomlet that that has come together with the investment that had been going on over time to create a critical mass. And that's why you're now seeing the immense resurgence that you have. Without that, would still look a little like we’re pushing on a string. One of my sons refused to own a car for a long time. Twenty-five-year-olds didn't say that until recently. Environmental consciousness and some of that stuff have made a difference. But I think the major thing is demographics, coupling up nicely with a critical mass of investment. We still have one big glaring negative. It’s been there for a long time and it's gotten worse, not better: that is the tremendous polarization and wealth among our population. For most of the last 50 years, we’ve been creating a lot more low-paying jobs. When you create jobs at the two ends, you're going to drive a wedge in your population. And America has been reluctant to embrace policies that would mitigate those policies very well. And it sure doesn’t help when we have racism. When you’re creating haves and have-nots, you’re going to find ways to put people into the have-nots, right? In America, unfortunately, our history being what it is, black people have ended up in the have-nots much of the time. So you take a city like Richmond. We have a big poverty problem. A quarter of our people are in poverty. More depending on how you look at the numbers. The majority of them are African-American, though not solely. And there tend to be pockets of poverty east and west. Up and down Jeff Davis corridor and I-95. Into Petersburg and Hopewell. That is our big challenge and we have good efforts happening -- the Community Wealth Building Office, for example. Those are not going to be enough to do it. We are still going to need a serious policy of figuring out how to up-skill and get people to create jobs. That is still our biggest unsolved challenge. It can. It can't do it all alone. But if you mean what community planning, neighborhood planning can do, is it can create better proximity. Bringing opportunities in terms of jobs to neighborhoods that don't have them is absolutely essential. Creating much better ties between neighborhoods, schools and business. Planning can be very helpful there. But planning needs the muscle and resources to do it. Are you involved in the city’s master plan updates? Hugely. We did the background research all last fall and summer to inform the planning process. One of the projects, when I was there, was to do an analysis of 6 neighborhoods and retail. So when you say to people, what do you want? They say, “I want a decent house, a yard,” which means probably single-family house, detached. I want a respectable grocery, minimum 50,000 square foot. But in order for that supercenter to have enough customers to support it, you need 15 times the amount of housing units you can build with single family detached. Because that grocery can’t get enough dollars otherwise. In the suburbs, people are driving and parking in those big seas of parking. But we can't put those big seas of parking in the city. So you quickly reach the conclusion: You have to go up. You have to have multiunit housing just to support a small grocery story of 30,000 square feet And what’s in people's minds when you say multiunit housing is Chamberlayne Avenue or Gilpin Court. Why would you want to bring that in my neighborhood? I'm trying to improve. So that's the narrative battle that [city planning director] Mark Olinger’s facing. It's an uphill battle. You should come to a public meeting and explain. [Laughs] I've been shouted down hundreds of times at community meetings. At the end of the day, we need good examples. But we need examples where the city does a complete job. I can't tell you how many times cities do part of the job. We’ll build the housing, but that’s not it! Come on, man. Put in the money. So I don't blame people for being skeptical, especially poor people in some neighborhoods. They’ve been done to a lot.